Doing repairs on your roof seldom happens, but when it does, are you going to do it manually or using a roofing nailer? Roofing nailers make your job way faster and easier compared to manual work. 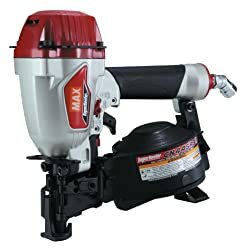 However, you need to know the important things to look for when choosing the best roofing nailer in the market. 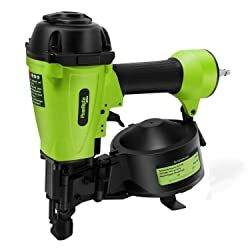 Here, we’re going to show you a quick and easy guide to know how to choose the best roofing nailer for 2019. 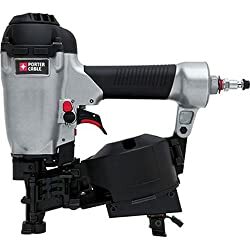 Likewise, we’ve included a comparison chart and in-depth product reviews for the top 10 best roofing nailers for 2019. 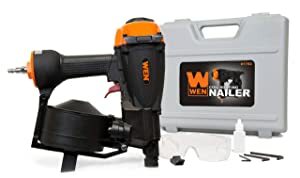 Here are the important features and factors you need to look for when choosing the best roofing nailer for 2019. Take a closer and learn more. There are two main options for this: compressed air or cordless. Both have their respective pros and cons. The pneumatic types provide better power and effectivity. However, some setbacks for pneumatic types include secure air fittings, air hose length, and air compressor unit. On the other hand, cordless types are very portable and convenient. They still provide decent power, enough to get the job done but very dependent on the capacity and type of battery. Working on the roof is very dangerous and you will not have enough time to grab on things. Better choose a roofing nailer where it is easy and fast to reload. This gives you more time to focus on your work rather than on reloading. 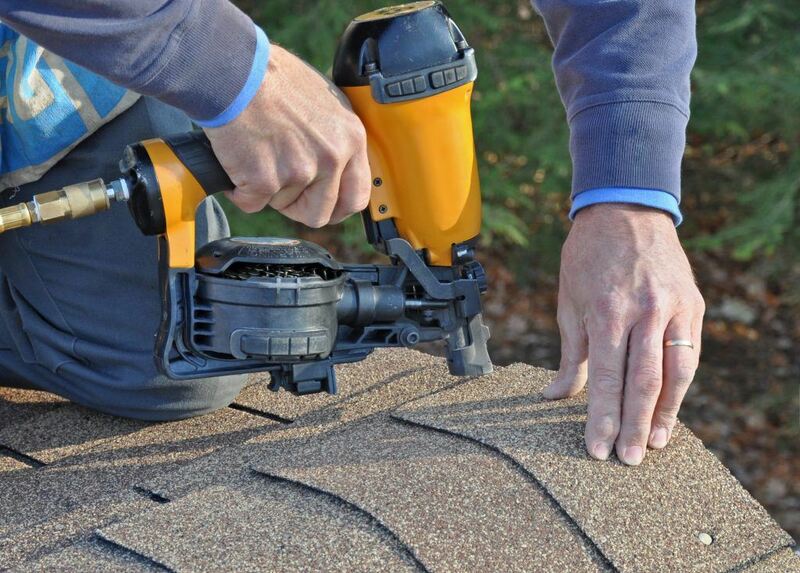 A roofing nailer must not be that heavy in order not to destroy or crack any shingles. Likewise, lightweight and soft rubberized grip handle are convenient and comfortable for the user. Buying this tool is an investment. Thus, you need to weigh the quality and performance versus its price. If there is a slight 2 to 3 difference in features then buy the unit with more features considering you will be using this for a long time. 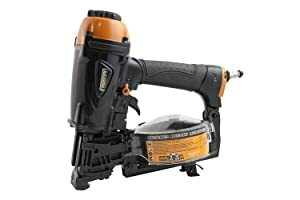 This roofing nailer is great for the budget and quality. You can do like 2/3 of the roofing jobs using this tool compared to manual nailing in a day. There is very least jamming and reloading comes really easy. This is a great tool for the hobbyist and DIY. Reasonable price for good quality. 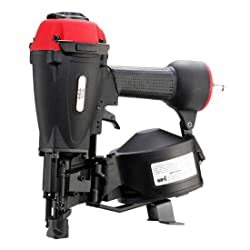 The highlights of this roofing nailer are its affordable price and quick reloading mechanism. Other things to love about it include a soft rubberized handle, lightweight, and very least jamming. It has a durable built and easy depth adjustment. Sometimes there is misfiring but manageable. The best thing about this roofing nailer is its accurate shooting. Likewise, its build is as solid as Hitachi roofing nailer. The side loading mechanism is smooth and easy. It is lightweight to use and the soft rubberized handle makes it more comfortable. This roofing nailer is durable enough to withstand any harsh conditions due to its quick driving mechanism. It is comfortable to use because it is lightweight and there’s soft rubberized handle. Its carbide tip is durable enough to resist extreme applications. Only one thing we don't like is slightly higher price. 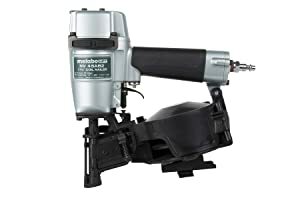 For an affordable roofing nailer, this one is no inferior compared to high-end brands. It can effectively drive through drywall, fiber cement, and insulation board. The side reloading function works perfectly fine. Worry-free for it has a carbide tip which resists wear and tear. Besides that, some parts are made from plastic. This roofing nails rarely misfires and jams. The overall built is tough and rugged. It has anti-slip rubber pad and pretty lightweight which prevents hand fatigue. Its contact tip is tough enough to resist wear and last longer. The tangle-free swivel joint on the male piece connection is really useful. Moreover, reloading is quick and hassle-free. A little trouble is no belt clip. 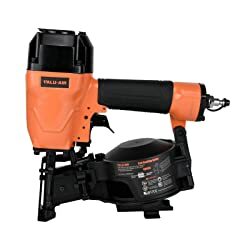 This is a good quality roofing nailer for an affordable price. It can drive at 15 degrees without any hassle a ¾” to 1-3/4” coil nail. Amazingly, the tool-free depth adjustment works without a problem. Moreover, the sideloading for the coil nails is smooth and easy to reload. Sometimes it jams but easy to clear though. The depth tool-free adjustment works perfectly fine paired with the smooth side loading, added convenience. The overall construction is durable enough to take a few accidental drops. The quality is more than what you paid for. The quick action bump mode of this tool is able to maintain drive precision which is not that inferior compared to other brands. Nice tool for DIY and beginners. Likewise, can be used for underlayment, cedar shingles, wall sheathing, asphalt roofing, and installation of sidings. Sometimes jams but easily clears off. This one is durable enough to last 22 bundle roof or around 8,000 coil nails. You can pair this with a porter cable 6 gallon 150 psi air compressor. When working, it seldom jams but if it does you can easily clear it out. Overall casing construction is decent and tough. Good tool for repair. Some parts are made from plastic. It can go over 7,200 coil nails with very least jamming. 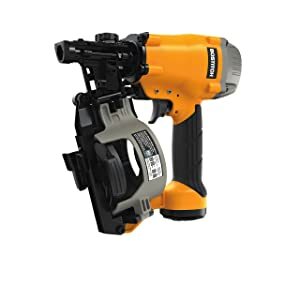 This roofing nailer is also able to maintain precise depth drive despite several firing. Overall body built is rugged and professional-looking. This is a great investment for home repair and DIY. A bad news, sometimes misfires.